Nothing quite like DooM to start the day :-). 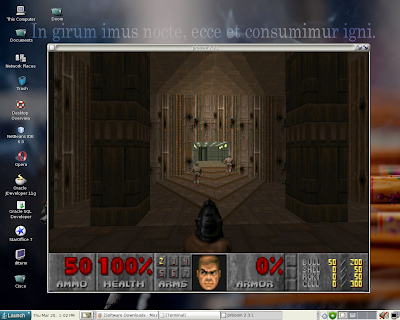 prboom, an open source OpenGL DooM engine works quite well on Solaris, and it can be used with any DooM or Hexen / Heretic .WAD file (including some opens source content like FreeDOOM). 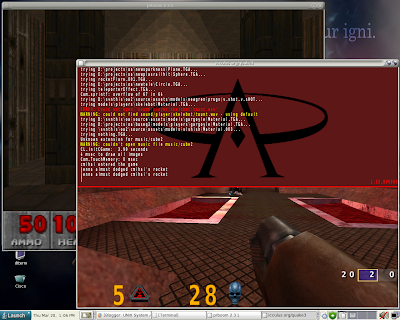 If you want fully open source content, you can use ioQuake3 + OpenArena or prboom and FreeDOOM. So there you go, StarCraft, Quake 1,2,3, OpenArena, Doom 1,2, Heretic, Hexen and just about any DS game (FreeDOS / DOSBOX) will work just fine on Solaris. Not to mention things you can with Wine or just fine in VirtualBox.